Maybe I'll read a good book this weekend. 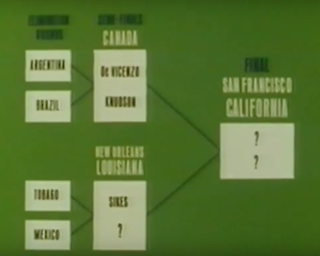 One of the programs that I'm most excited about this 1970 weekend is Shell's Wonderful World of Golf, "a championship, international elimination tournament, played on the world's most famous courses." 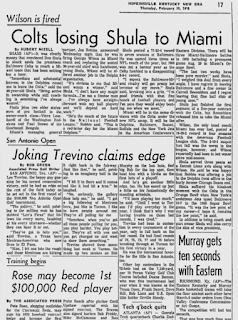 Our episode here features Julius Boros, Lee Trevino and 1957 KHSAA state-champion and 1964 Kentucky Open winner Frank Beard (of Louisville Saint Xavier) at a country club in Mexico, playing for a spot in the semifinals against Dan Sikes. Shell's Wonderful World of Golf, says Wikipedia, "was notable for also including information about the host country for that week's show. It also included some of the conversations between the contestants between the shots. As such, it allowed to audience to feel they were part of a foursome traveling with the competitors and host, as opposed to being just a spectator in the gallery." 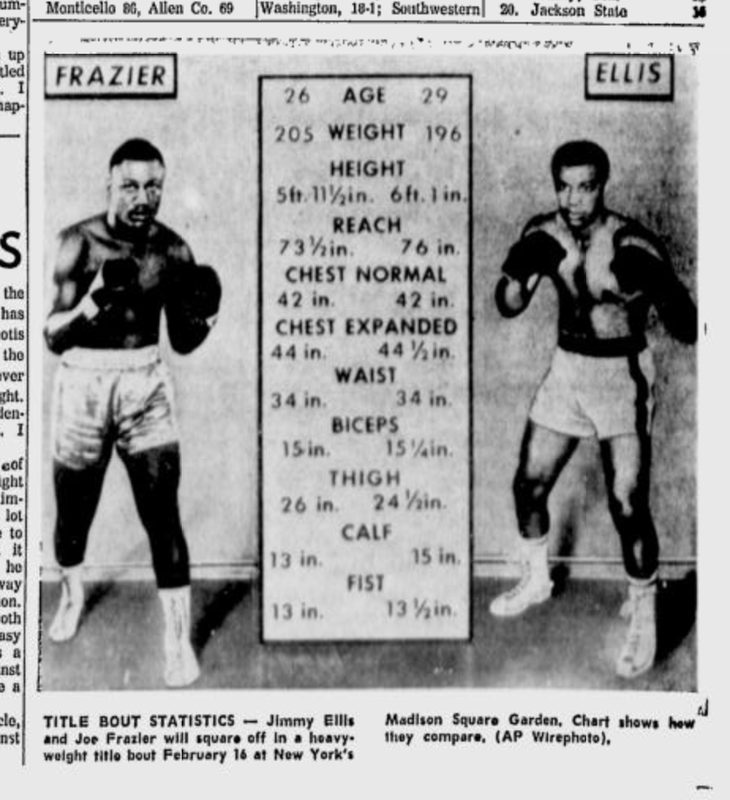 I'm also excited to watch the ABC's Wide World of Sports replay of the heavyweight title fight matching Joe Fraizer against WBA-champion Jimmy "The Cobra" Ellis (of Louisville Central High School and, later, of the Louisville Parks Department). The bout was earlier this week and broadcast on the Mutual Broadcasting System radio network, and I know how it came out. But I'm not going to spoil it for you, and I'm still excited to watch, anyway. There is a chance that I'll cut out for Bowling Green on Saturday afternoon to check out Morehead State my No. 16 WKU Hilltoppers. This Murray State deal is ridiculous. Actually, I'm pretty sure we're not going to have to worry about these 10 seconds. 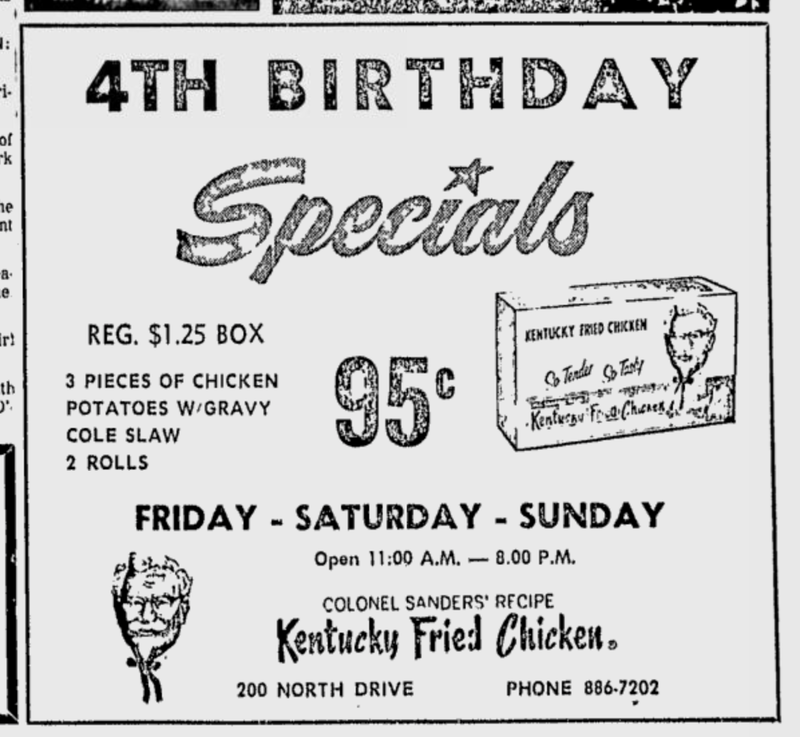 If I go over to Bowling Green this evening, I might get KFC to go on the way out of town. 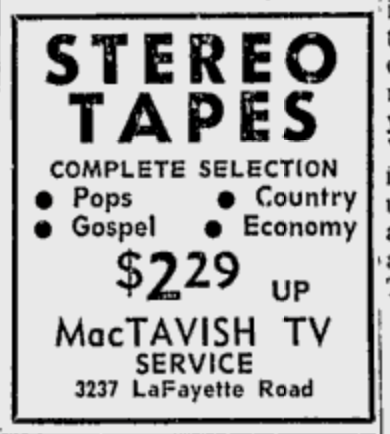 I might even pick up myself a new stereo tape or two to listen to on the way across U.S. 68/Ky. 80 and back. Breaking ... Upon further review, I think I definitely will drive over to Bowling Green for the WKU game and then stay over at the Western Hills, just for the heck of it. 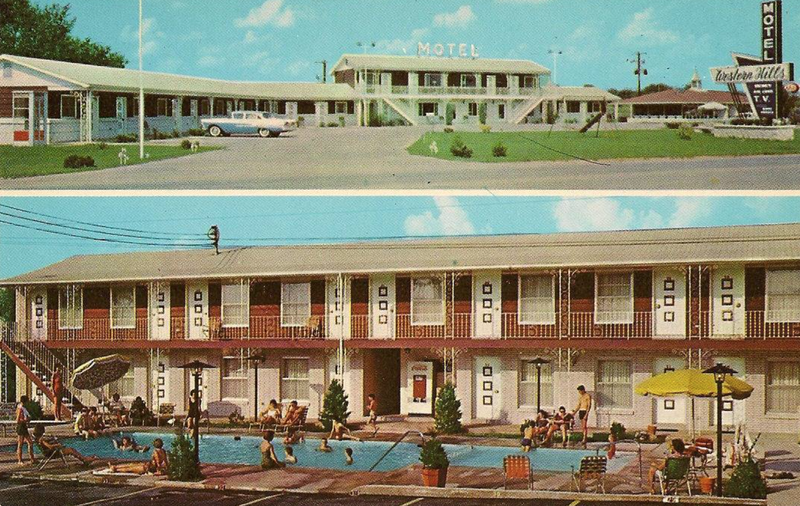 So, as you can see, Hoptown 1970 me is getting by just fine without pro football. 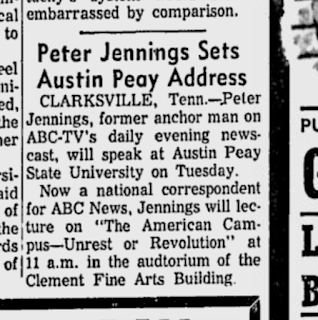 And maybe I'll go see Peter Jennings next week. 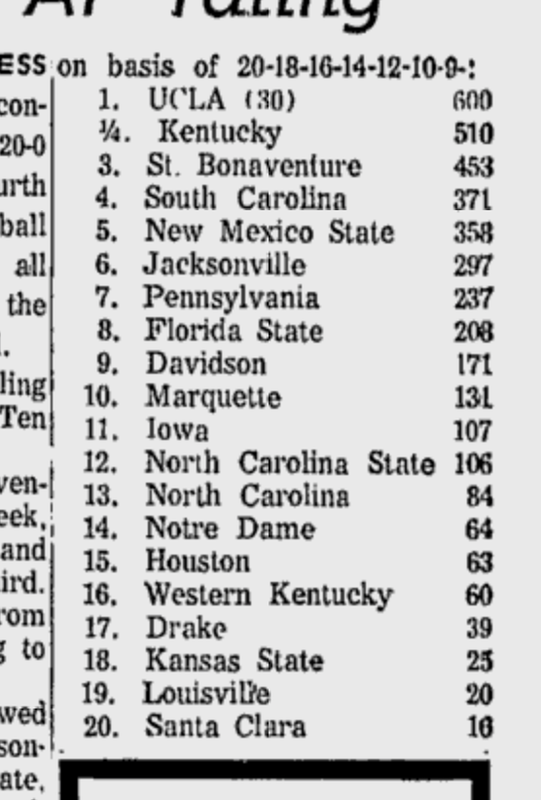 By the way, it's amazing to think about how good this UK team might be doing without all of its personnel issues. Mike Casey was injured before the season. 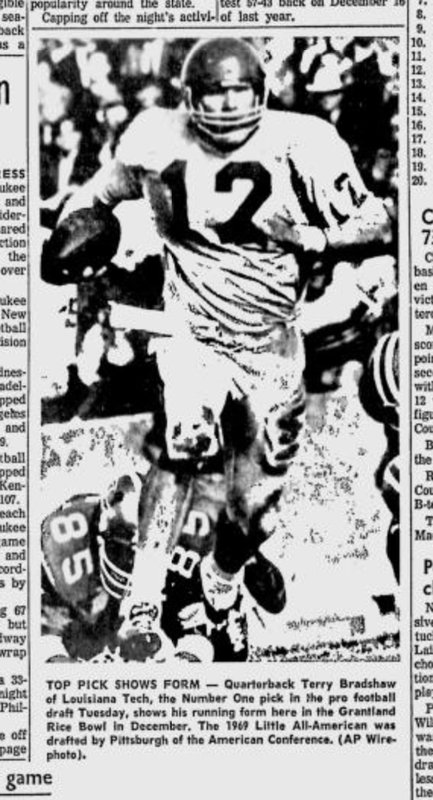 Then Larry Steele missed several games. 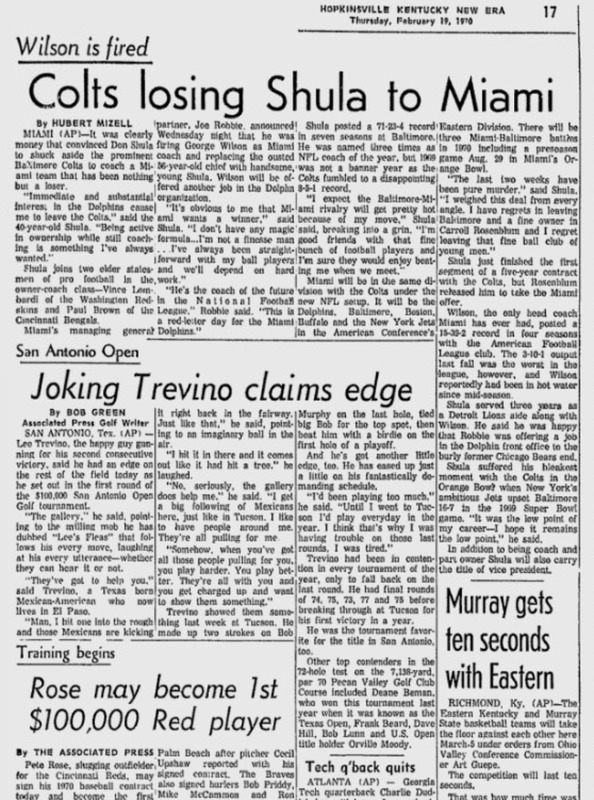 Then even Dan Issel was injured for a little while. Then Adolph Rupp suspended a half-dozen of his players and kicked two of those off the team for good. And, yet, the Wildcats have now won five in a row. 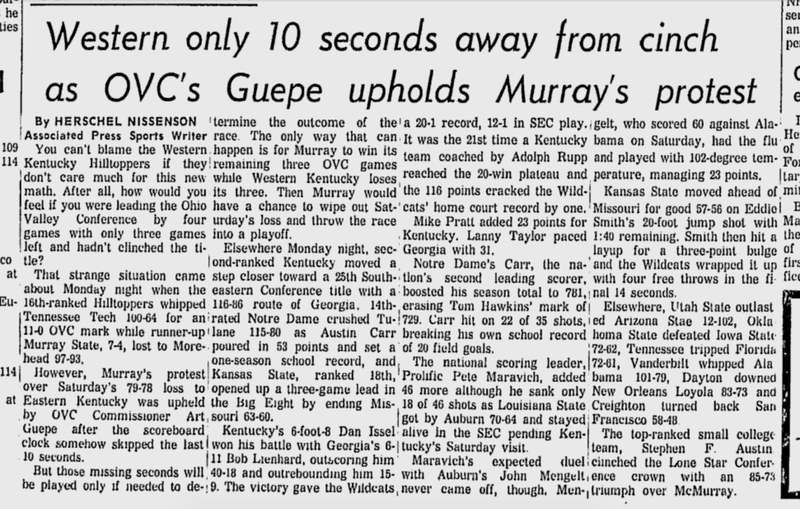 This past 1970 week saw victories of 110-66 over Florida and 116-86 over Georgia at Memorial Coliseum. “I’ve never had a team that played as flawlessly as this,” Rupp said after the win over the Gators. From years of reading UK message boards, I can assure you that many, many people have thought about how UK would have done without all of its personnel issues. Saturday, Feb. 21, starts a two-game road swing for UK: at LSU and then at Alabama two days later. 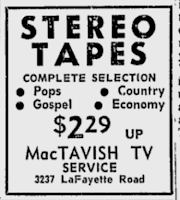 Actually, if that LSU game is a night game, I'll be listening to Cawood Ledford, and I'll probably pass on swinging by MacTavish's to see what new stuff they have. This is the second or third season that only WHAS's Cawood has been doing the UK radio broadcasts, and this "UK Radio Network" setup seems to be working out fine. In the 1950s and into the '60s, the structure for the broadcasting of UK sports over the radio was radically different than now. Back then, there was not an official "UK Radio Network." 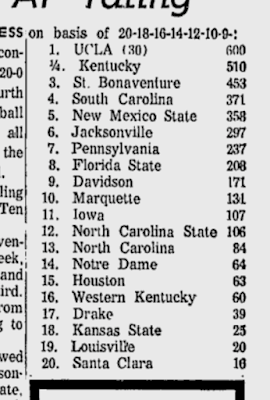 Instead, myriad radio stations or radio networks carried the Wildcats. 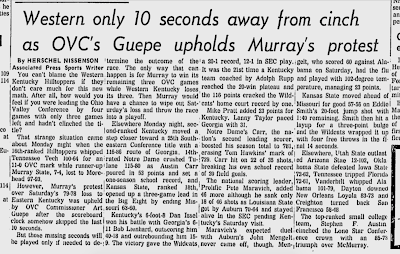 Over time, two of the many play-by-play men calling the Cats rose to the greatest prominence. 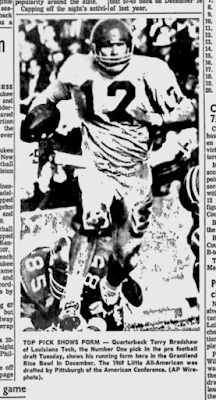 One was Cawood Ledford, who broadcast over the massive megaphone provided by WHAS radio's 50,000-watt signal. Claude Sullivan, who called the Wildcats games for WVLK and the 17 stations of the Standard Oil radio network, was the other. The native Kentuckians, Sullivan from Clark County, Ledford from Harlan County, were friendly rivals. 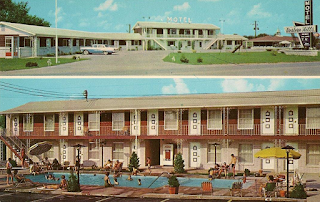 They were roughly the same age, Sullivan having been born in 1924, Ledford two years later. While Ledford built a nationwide following for both UK and himself thanks to the vast reach of WHAS, Sullivan was the better known of the two in and around Lexington. Rest in peace, Claude Sullivan. Wikipedia: "In 1964, he was hired to work alongside of Baseball Hall of Fame pitcher Waite Hoyt as broadcaster of the Cincinnati Reds' Major League Baseball games. When Hoyt retired in 1965, Sullivan took over the primary play-by-play responsibilities. But after two years, Sullivan was diagnosed with throat cancer, and he died on December 6, 1967, at the age of 42." I'm starting this weekend off, though, with one of the all-time great Brady Bunch episodes. 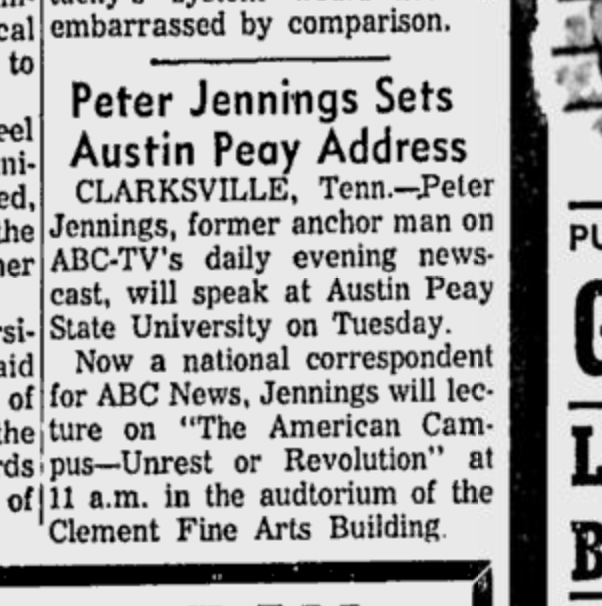 Here's the Associated Press description, as presented in Hoptown's Kentucky New Era: "Peter gets a swelled head after rescuing a girl." This episode is so good and important that I think it might require its own post at some point. -- Shop at MacTavish's in the morning and pick up a couple of new 8-tracks. -- Catch the UK game at LSU on NBC early Saturday afternoon (I'll probably turn down the sound and listen to Cawood). 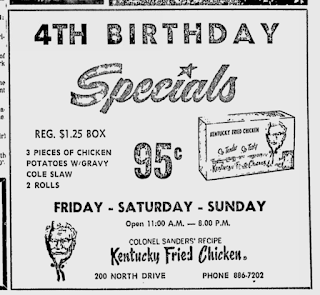 -- Pick up some chicken and listen to my 8-tracks while driving over to Bowling Green. -- Check in to the Western Hills to watch the Jimmy Ellis fight. -- Go over to Western and watch the Morehead game. -- Maybe get back to the room in time to catch the end of Andy Griffith's variety special on CBS. -- Get up and have breakfast at the Western Hills restaurant, which is where Coach Diddle frequently has his breakfast. -- See what's shaking downtown at First Christian Church (Disciples of Christ), which is celebrating its 125th anniversary this year. -- Hustle back to Hoptown, listen to my other new 8-track and get home in time to check out Frank Beard on Shell's Wonderful World of Golf. Pretty Hope Lange handles herself in spirited style as the widow, and Edward Mulhare is properly lusty and tempestuous as the salty ghost. There are a couple of cute children, a starchy housekeeper and a nervous real estate man. This show is down to its last four episode, and here's tonight 1970's, "Martha Meets the Captain." Well, heck ... TKO for Frazier over Ellis in Round 5. Howard Cosell actually gave Round 1 to our man from Louisville (though some of the YouTube commenters indicated this was probably because Ellis was Muhammad Ali's friend). 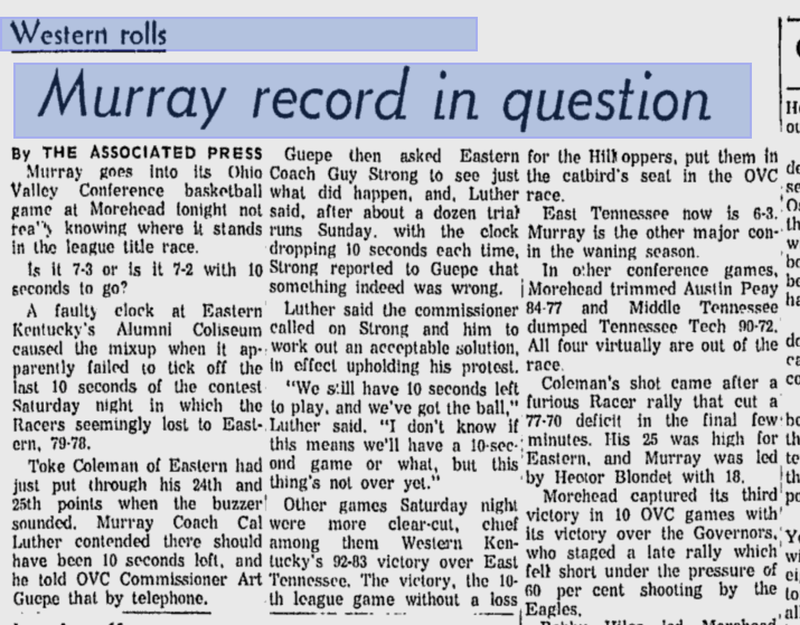 Interesting, too, to hear Cosell's call near the end of the fourth: "Down goes Ellis! Down goes Ellis!" Great Frazier quote after the fight, on hitting Ellis: "It feels like when you hit a baseball, and it rides out in to open field--that's the way his chin felt." It's been a loooooooong time since I watched a professional boxing match from beginning to end (even one as short as four rounds, plus the TKO at the start of the fifth). I enjoyed this one a great deal. By the way, the first 8-track I bought and listened to on the way over to Bowling Green was Aretha Franklin's This Girls' In Love With You. I really love her current single, "Call Me," and I think it's really gracious that John Lennon and Paul McCartney gave her "Let It Be" instead of recording it as a Beatles song. Uncle Charlie plays the cello! The second 8-track I got was Simon & Garfunkel's Bridge Over Troubled Water, but this one didn't much grab me. I do like "So Long, Frank Lloyd Wright," and I appreciate that they covered "Bye, Bye, Love." Brownie, represent! Hoptown 1970 me is more of a Neil Diamond guy when it comes to New York singer-songwriters. On the other hand, the Osmonds are pretty excited about the new Simon & Garfunkel. "Bridge Over Troubled Water" is the new Cash Box No. 1. WE FORGIVE YOU, VIKKI CARR! Once again, I would need to know more of the facts before I forgive her. We've been seeing a lot more of Andy Griffith on TV since it was announced CBS would be ramping up a new series for him this coming fall. I am, of course, thrilled! Here's Andy in a sketch with Paul Lynde and Dean Martin on Dean Martin's show in January 1970. Uncle Charlie might be a Shell's Wonderful World of Golf fan, too. Of all these half-hour country-music TV programs from this era--and there are a bunch of them, and, of course, Nashville's channels show all of them--the most curious-looking of all of them to me is the Del Reeves Country Carnival. My favorite is Porter Wagoner (because of Dolly Parton), and the slickest is Hee Haw. But the most curious-looking one of all is the Del Reeves Country Carnival. First of all, Del Reeves is a really off-kilter personality for a TV host. Second, there's the crazy set. And, third, people are often doing things like playing their instruments in odd contortions. My Three Sons has some very sweet moments. I was never a big fan of "My Three Sons" either. I think Hollywood knew what it was doing when it cast Fred McMurray as a bad guy in shows like "The Apartment." Everybody would prefer Hazel to My Three Sons, but that's a false choice. It's not like we live in a world where you get to just pick and choose shows out of the Ether to watch; it's either you watch My Three Sons to warm up for the Andy Griffith special on CBS, or you watch the first 30 minutes of some old movie and get yourself stuck for two hours on NBC, or you watch a half hour of Lawrence Welk songs. Those are the choices. Given those choices, I would go for the movie or the Lawrence Welk songs. I always liked the Lawrence Welk show. Fair enough. I like Lawrence Well, too. Here you go. CBS cut down the My Three Sons videos on YouTube! I, for one, saw the Andy Griffith special when it originally aired three years ago, and I'm not going to run the risk of missing the opening number. By the way, ABC has announced its fall 1970 schedule. Out: It Takes a Thief, Paris 7000, The Flying Nun, The Ghost and Mrs. Muir, Here Come the Brides, Land of the Giants, Jimmie Durante and the Lennon Sisters and Englebert Humperdinck's and Pat Paulsen's programs. -- "The Partridge Family, in which the mother joins her children in a rock band. It sounds amazingly like the Cowsills." Also: "On Monday nights at 9 p.m., the network is offering NFL professional football games for those fans still eager after Sunday's action on NBC and CBS." Incidentally, I'm a little concerned that Jerry Buck is the AP's writer on that story. Como, with a distinguished gleam of silver in his hair and a voice as rich as ever, strolled through a tuneful NBC hour Sunday night. It was sparked by the comedy of Flip Wilson and, especially. Bob Hope, who never seems to run out of topical material presented in bright, sly framework. Now that the television networks have pretty well made up their schedules tor next season--ABC ought to be announcing its plans this wee--all three can he more relaxed about interrupting regular programs for specials. More specials will be turning up from now until rerun time starts at the end of March and early April. Earlier in the season there was pressure to measure the performance of individual series against the competition. Special programs are important in these days when few series turn out more than 26 programs a year. The specials help fatten and lengthen the season and provide a change of pace. They are also important as advertising vehicles for companies which prefer the solid impact of an hour special to scattering their commercials among various series. That's some rock-solid contextualizing right there. 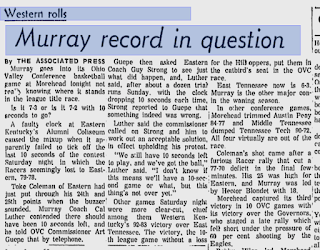 But then this past week in the 1970, it was Jerry Buck on the AP TV-and-radio bylines in the Kentucky New Era. I'm hopeful that Ms. Lowry simply went on vacation for a week or two once CBS and NBC announced their fall schedules, but I'm concerned that she might've retired or something. She'd been at it at least since 1958. Here's a Cynthia Lowry mention in a biography of Shirley Booth, who played Hazel.